The "Ultrafiltration Market by Type (Polymeric, and Ceramic), Module (Hollow Fiber), Application (Municipal, And Industrial (Food & Beverage Processing, Chemical & Petrochemical Processing, Pharma Processing)), and Region - Global Forecast to 2023", published by MarketsandMarketsâ&#x201E;˘, the Ultrafiltration Market is projected to grow from USD 1,064.0 million in 2018 to USD 2,140.1 million by 2023, at a CAGR of 15.0% from 2018 to 2023.
the large size of this segment. The R&D departments of manufacturing companies are carrying out research to widen the application areas of ultrafiltration, which is expected to drive the Ultrafiltration Market during the forecast period. APAC Ultrafiltration Market projected to grow at highest CAGR from 2018 to 2023 The Ultrafiltration Market in the APAC region possesses immense potential for growth. Increasing awareness of water and wastewater treatment and rising scarcity of fresh water are expected to fuel the demand for ultrafiltration during the forecast period. China, India, and Japan are some of the key countries in the region contributing significantly towards the growth of the Ultrafiltration Market in the APAC region. 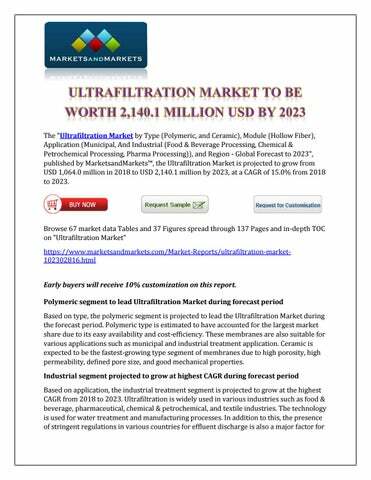 For more information, download Free PDF brochure at, https://www.marketsandmarkets.com/pdfdownloadNew.asp?id=102302816 Some of the key players in the Ultrafiltration Market are DowDuPont Inc. (US), Hyflux Ltd. (Singapore), Inge GmbH (Germany), Toray Industries, Inc. (US), GE Water & Process Technologies (US), Hydranautics (US), and Pentair plc (US), among others. Partnerships, agreements & collaborations was the major growth strategy adopted by the market players between 2015 and 2018 to enhance their regional footprint and meet the growing demand for ultrafiltration in the emerging economies. 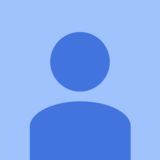 About MarketsandMarkets™ MarketsandMarkets™ provides quantified B2B research on 30,000 high growth niche opportunities/threats which will impact 70% to 80% of worldwide companies’ revenues. Currently servicing 7500 customers worldwide including 80% of global Fortune 1000 companies as clients. Almost 75,000 top officers across eight industries worldwide approach MarketsandMarkets™ for their painpoints around revenues decisions. Our 850 fulltime analyst and SMEs at MarketsandMarkets™ are tracking global high growth markets following the "Growth Engagement Model – GEM". The GEM aims at proactive collaboration with the clients to identify new opportunities, identify most important customers, write "Attack, avoid and defend" strategies, identify sources of incremental revenues for both the company and its competitors. MarketsandMarkets™ now coming up with 1,500 MicroQuadrants (Positioning top players across leaders, emerging companies, innovators, strategic players) annually in high growth emerging segments. MarketsandMarkets™ is determined to benefit more than 10,000 companies this year for their revenue planning and help them take their innovations/disruptions early to the market by providing them research ahead of the curve.